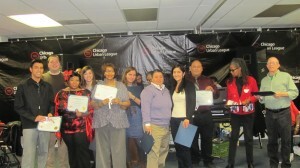 MTO honors volunteers at the 2012 Holiday Party. Many of MTO’s volunteers started out looking for answers to questions about their housing. Today, over half the calls on the Tenants’ Rights Hotline are answered by former callers turned volunteers. If you are between jobs or retired with time in your hands, don’t let your skills deteriorate. Keep up with the world, refine your skills, learn new ones, explore careers, earn glowing references, and meet new people while helping others keep a roof over their heads. If you are college student and you are interested in organizing, housing, health, or social justice you can intern with us while earning independent study credit! Volunteering is a great way to boost your resume and gain valuable experience! We are looking for help in various areas, including: hotline counseling, data entry and management, community fundraising, special projects, and more. Send us a note with your resume to regina@tenants-rights.org and let us know what you are interested in. See how you can get involved today!